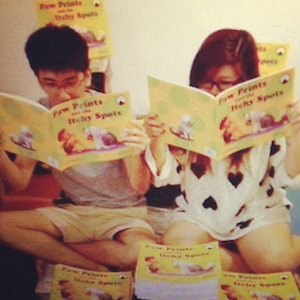 ​Closetful of Books began with Denise Tan and Kelvin Ng in 2013. Denise spent 6 years working with Bookaburra Books and a few years before that studying Mass Communications and English Literature. She spends most of her time reading but of course, that is her job. Kelvin is trained as an engineer and is stereotypically meticulous and assiduous. He spends every other second wondering how he ended​ up working with literature and the rest of the time he spends taking care of Closetful of Books' operations and finances. Because we grew up accompanied by magical stories and continue to believe in the power that lies between the pages of a book, we would love for as many kids as possible to have the same. We know that there isn't a child in the world who can do without a book and that every child can become a super-duper voracious reader. ​​With that as a mantra, we visit schools with a vast and specially-curated selection of picture books, early readers, novels, non-fiction titles and graphic novels for book fairs and extend superlative library consultancy services. We really enjoy basking in the company of talented and dedicated authors and illustrators​ ​too and love organising author visits and literary festivities in schools. And since we clearly relish any opportunity to go on about books, we quite happily conduct workshops for parents and teachers about reading for pleasure and growing a child's reading repertoire.